Recent photos posted on this blog have been showing the dismantling of the balcony and ceiling in Alumni Hall — both essential parts of the building during its time as Knox’s theatre. The same central part between the two literary society buildings that once served as a library was also the College’s theatre from 1928, when the library collection was moved to Seymour Library, until 1965, when the Ford Center for Fine Arts opened. 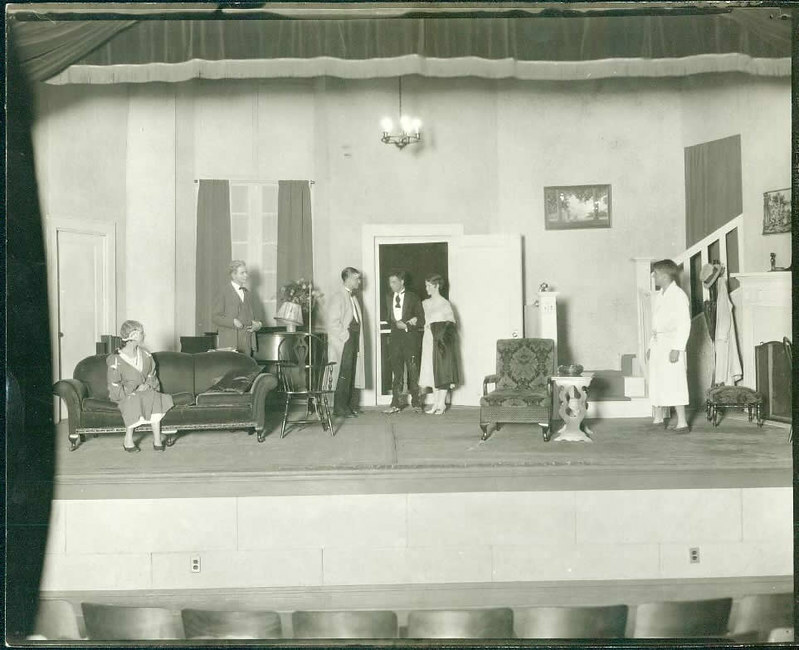 The photo above is of a play put on in 1930 called Tommy. The 1963 renovation added a state-of-the-art light board, four dressing rooms, a sewing room, extra closet areas for costumes, a light room, and a makeup room, as well as fire-safety measures. When the Center for Fine Arts was constructed, Harbach Theatre became the main stage for the College’s productions, although the stage and seating in Alumni Hall continued to be used as a general-purpose meeting area and alternate theatre. The stars of the Alumni Hall stage were immortalized by the graffiti that each cast member left after a show along the inside walls of the theatre and on the ceiling above the catwalk. Graffiti left over the years can be seen in this video. Tagged Alumni Hall, auditorium, Center Hall, grafitti, interior, Plays, Stage, Theater, theatre.